Self-acclaimed white supremacist, Brenton Tarrant, walked heavily armed into Al Noor Mosque and Linwood Mosque in Christchurch on Friday, March 15, 2019, shooting at several worshippers, including children. The 28-year-old Australian livestreamed his attack at Al Noor Mosque, where he killed at least 40 people, before he moved on to Linwood Mosque where he continued his rampage before he was caught by authorities. One of the survivors of the attack, Alabi Lateef Zirullah, a Nigerian, told NZ Herald that he was the first to sight the gunman and stood up to him to prevent the loss of more lives. Alabi, an Imam at Linwood Mosque, said he was ready to die to defend the worshippers of his mosque when Tarrant stormed the place of worship on Friday. He said, "The incident happened in such a way that I'm the first person who sighted the guy. I can't believe it, I thought I would be gone. Anyway, I was ready to die because I felt for the brothers. Myself and one other brother, Abdul Aziz, we put ourselves forward. "I'm the first person who sighted him when he started shooting. He shot two couples, he shot them dead just right in front of the masjid when they peeked through the window. "No one listened to me until he unfortunately came from behind and shot one of our brothers in the head through the window, he saw him standing and shot him. So when the glass got broken and the brother fell down, everybody realised." Alabi had previously spoken about how Abdul Aziz, his fellow unarmed worshipper, chased off Tarrant by picking up a disposed machine gun and smashing it on his car's window while the attacker was trying to retrieve more weapons. "He (Aziz) went after him...and that's how we were saved. Otherwise, if he managed to come into the mosque, then we would all probably be gone," Alabi told Sky News. Tarrant drove off after he was chased by Abdul Aziz and was arrested by authorities moments later. 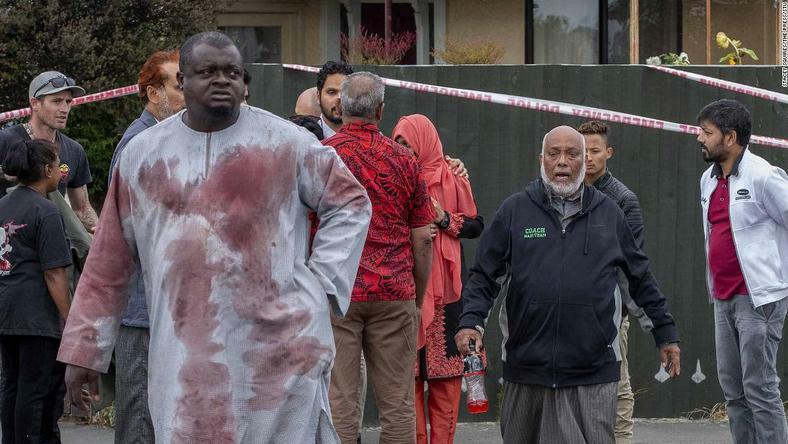 Also speaking to NZ Herald, Gamal Fouda, an Imam at Al Noor Mosque, said the attack has traumatised him so much he hasn't been able to get much sleep since it happened. "He was shooting people and we were hiding and couldn't even breathe from the smoke and bullets flying everywhere," he said of the attack. At least 50 people were also injured in the attack with 34 of them still hospitalised and 12 in critical condition as of Sunday, March 17. Tarrant, considered the lone suspect, has already been charged to court with one count of murder and has been remanded in custody without a plea. He is due in court again on April 5 with more charges expected to follow.